Like old-school baseball uniforms, a stylish three-piece suit or racing stripes on a classic car's paint job - pinstripes are a timeless touch! Now you can stick that look on all your letters and packages when you choose these return address labels from CheckAdvantage. White stripes on four subdued shades will leave your mail looking sharp! But appearances aren't everything. What you'll really love about your new labels is that they make life a little bit easier. You can stop scribbling out your name and address all the time. When preparing outgoing mail, just peel off a label and stick it in place. The convenient, self-adhesive backing makes things simple. 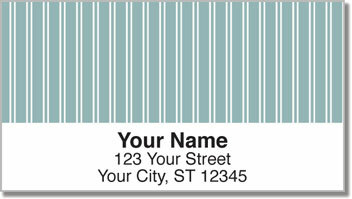 Order your own Pinstripe Address Labels today! Don't forget - you can also get matching personal checks.